Two Sentence Summary: It’s really hard to sum this novella up in two sentences without giving anything away. What I will say is that this is the first book in the Binti Trilogy and my first foray into reading Afrofuturism Science Fiction and it certainly will not be my last. What Bombed: I won’t say that this bombed, but I definitely didn’t care for it. She refers to the Meduse as ‘It’ even after she has provided the reader with their names. Their gender is in fact unknown, but I feel that when she says, “Okwu, it” or “Chief, it” diminished the Meduse as a credible character. The Meduse is a jellyfish like creature, and for lack of a better term I’m going to apply the term non-binary to them as no gender is specified. There are a couple of Meduse who she refers to by name – one is a juvenile by the name of Okwu and then the Chief of the Meduse. I wouldn’t be doing my job as king if I didn’t remind you what you are. My Thoughts: My copy of Binti is less than 100 pages and it took about 2 hours to read. We meet Binti as she is trying to get her transporter started. She is running away from home, but not really she’s going to Uni against her parents wishes. The most prestigious Uni in the galaxy and she is the first of the Himba people to be accepted to Oomza University. Right off the reader is confronted with this strong, courageous female who is determined to do and be something more than what her family has predestined her for. Her sister calls her selfish for wanting to leave and go to Uni and her brother thinks she’s joking. Well, ha little brother jokes on you! The two things I hoped wouldn’t be in the novella are – colorism and classism. It takes place on Earth in some unspecified time in the future. You would think if they have learned how to turn giant bugs into space ships they would have been able to eradicate the preoccupation of skin tone and classism. For example the Himba people, Binti’s people are dark-skinned and the Khoush are light-skinned. The Khoush look down on the Himba, but to be fair the Khoush look down on everyone. And, they are responsible for the slaughter of the Meduse. Binti survives the slaughter by the Meduse aboard the ship and makes it to Oomza University, but there is a price that she will have to pay. Binti is an outsider. At Oomza University she is the first and only Himba and she may become an outsider with her family and community. I can’t say anything else without giving things away. 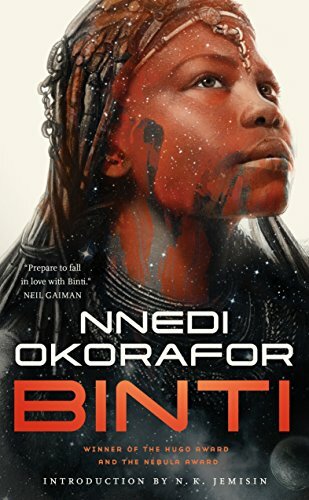 Hopefully, I’ve persuaded you to pick Binti up and give it a read. I read the Binti trilogy a little while ago and enjoyed it pretty well. I think I liked the second book most; I agree with you that the first is mostly setup. I look forward to seeing what you think of the rest. I purchased the Omnibus last month and it contains a new story, which is in between the first and second. Not sure if I should read it the way it was originally published or in the order printed.